Just received the 3 games purchased for Christmas gifts, opened one to play with friends and had a ball. Great game, [it] showed us how much we did not know, and we learned a lot. Thank you, you have built a great educational game. Top quality and attention to detail. We had a game night at our 9/12 Project meeting and had a blast!! 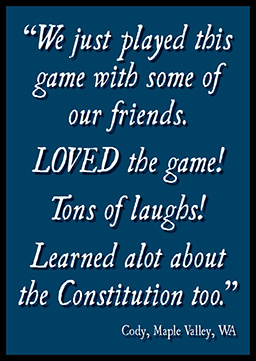 Your game provides a very entertaining (and hysterical) way to learn more about our country at a time when we so desperately need to learn the truth. Great game! Bought this game at Glenn Beck’s Man in the Moon event. Realized it was not the game he talked about, but decided it was a good choice. Just finished our first round with my grand daughters. They are 10 and 12! They loved it! After each question we would have a discussion about the social and historical meaning of the topic. I am confident that my grandkids will grow up with a clear understanding of our Country and our Rights!! We just played this game with some of our friends. Loved the game. Tons of laughs! Learned a lot about the Constitution too.